The bio of John Ching | Launceston Then! John Ching. Courtesy of Launceston Town Council. The Ching family were involved with Launceston from the early eighteenth century with a prominent conservative, Thomas Ching contesting the 1725 General Election. In the later years of the eighteenth century John Ching (1751-1803) had established himself within the town as a Chemist operating out of a shop and house in Broad street to the east of the White Hart hotel. In 1796 he had patented a worm lozenge which proved very popular providing enough wealth for John and Rebecca his wife, to open another shop in London. After John’s death in 1803, his widow carried on the business in London but by 1810 she had retired selling to a business partner. Their son Thomas (b. 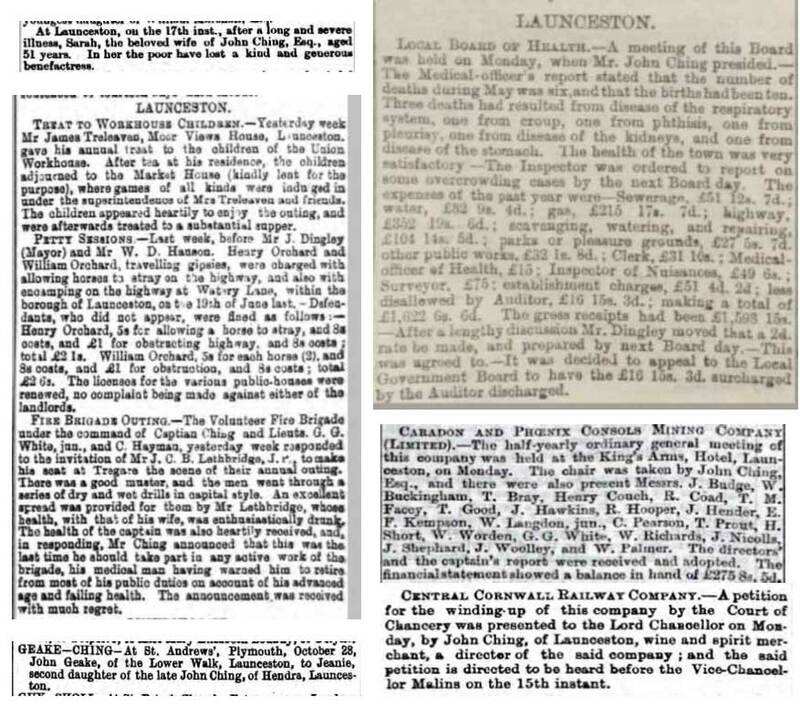 1774) continued with the Launceston business, expanding it by opening a shop in Stratton. Thomas along with W. C. Pearce, H. Nicholls and James Prockter issued the ‘Launceston shilling’ to aid trade. Thomas became mayor in 1828-29 and again in 1834-35. Thomas married Sarah Prockter in 1803 at Launceston and in 1809 a son, John Ching, was born at Launceston. John spent eighteen months in London with his education before returning to Launceston. He married Sarah Lawrence at Lifton in September 1837 and together they had seven children, Bessie, Thomas, Lawrence, John, Henry, Jeanie (the mother of Lawrence Ching Geake who was killed serving in the first world war) and Sarah. They set up home in Broad street, Launceston and as well as running the chemist business he set up as a Tea and Wine merchant. 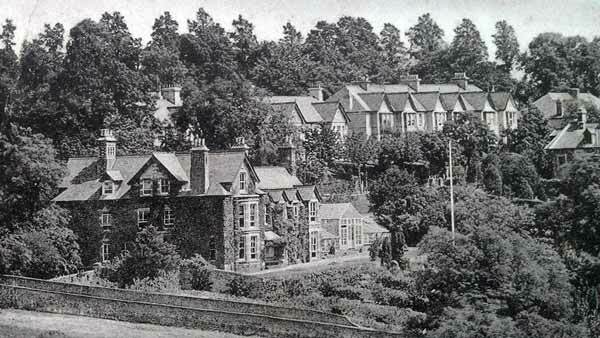 He eventually set up home in his later life at Hendra, Dunheved road, Launceston (below left) but by then his wife Sarah after suffering a long illness, passed away,on the 17th of May 1862. He was mayor of Launceston on four occasions 1841, 1853, 1870 and 1874 as well as presiding over the Local health board and many other organisations. He helped start the Launceston Savings Bank and was involved in many business start ups including Chairing the board of the Caradon and Phoenix Consol’s Mining Co. In 1859 he became an ensign in the Launceston Volunteers, later becoming a Lieutenant. 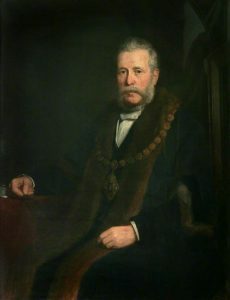 He was best known for being a strong proponent of the railways and spent many years supporting schemes that would bring the railways to Launceston. After many failed attempts the opening of the GWR railway line from Plymouth in 1865 was to prove a just reward for his perseverance as he was partly responsible for its existence from gaining the necessary Act of parliament right through to its construction and opening. Politically he was a strong conservative and was instrumental in the forming of the local conservative association in 1877 being made its first chairman. 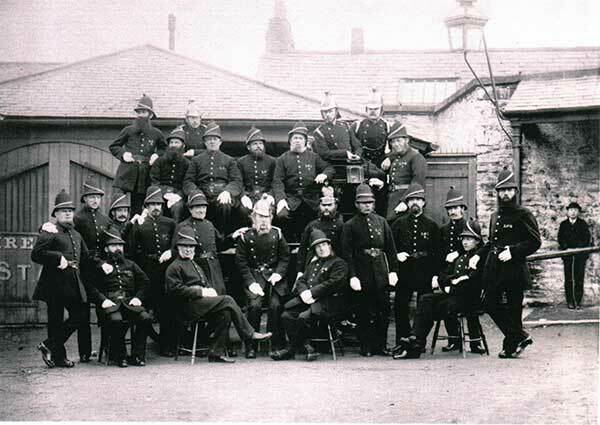 John surrendered his Aldermanship in order to become Captain of the Launceston Voluntary Fire Brigade (for which he, and Mr Gifford were among the founders) in 1878. During his latter years the chemist business passed into his partner, Mr. William Wise’s hands with his son Thomas continuing with the Wine stores and Spirit vault working out off Southgate street with its entrance in what is still known to this day as Ching’s Alley. Launceston Volunteer Fire Brigade with John Ching sat centre. During the first week of March in 1883 he fell seriously ill finally succumbing on the 12th of March 1883 at the age of 74. His funeral cortege contained not only John’s family but also the Mayor and council, with the Launceston Fire Brigade following behind with their engine draped in black and his helmet, uniform belt and whistle placed on top.